The El Niño Southern Oscillation (ENSO) monitoring system has moved to the “Watch” status from “Neutral” this month. Signs favouring El Niño conditions are emerging and are predicted to be gradually strengthening in the next 3 months (April – June 2019). The SST anomalies over the tropical Pacific Ocean’s Nino3.4 region were warm (0.52°C for February 2019, 0.59°C for December 2018-February 2019 3-month average). The current values are near but below the El Niño threshold. As a consequence, atmospheric conditions (e.g. trade winds and large-scale rainfall patterns over the tropical Pacific) have remained in the neutral range. However, the central Equatorial Pacific subsurface temperatures have accumulated sizeable warm anomalies. These subsurface warmer waters are expected to flow to the surface and further warm the SSTs to above the El Niño threshold (refer to Appendix for details on ENSO monitoring, variability, and impacts). Model outlooks from international centres for the 2nd half of 2019 show a wide spread of possible outcomes ranging from neutral to strong El Niño. This high degree of uncertainty is consistent with the lower predictability at this time of year for El Niño. The range of possible outcomes from model predictions can be expected to become narrower over the next three months. ENSO conditions are monitored by analysing Pacific sea surface temperatures (SSTs), low level winds, cloudiness (using outgoing longwave radiation), and sub-surface temperatures. Special attention is given to SSTs, as they are one of the key indicators used to monitor ENSO. Here, three different datasets are used: HadISST, ERSSTv5, and COBE datasets. As globally, SSTs have gradually warmed over the last century under the influence of climate change, the SST values over the Nino3.4 will increasingly be magnified with time, and hence appear warmer than they should be. Therefore, this background trend is removed from the SST datasets (Turkington, Timbal, & Rahmat, 2018), before calculating SST anomalies using the climatology period 1976-2014. So far, there has been no noticeable background trend in the low-level winds or cloudiness. El Niño (La Niña) conditions are associated with warmer (colder) SSTs in the central and eastern Pacific. The threshold for an El Niño (La Niña) in the Nino3.4 region is above 0.65°C (below -0.65°C). El Niño (La Niña) conditions also correspond to an increase (decrease) in cloudiness around or to the east of the international dateline (180°), with a decrease (increase) in cloudiness in the west. There is also a decrease (increase) in the trade winds in the eastern Pacific. Sub-surface temperatures in the eastern Pacific should also be warmer (colder) than average, to sustain the El Niño (La Niña) conditions. For ENSO outlooks, information from the World Meteorological Organization (WMO) and international climate centres are assessed. The centres include the Climate Prediction Center (CPC) USA, the Bureau of Meteorology (BoM) Australia, as well as information from the International Research Institute for Climate and Society (IRI) which consolidates model outputs from other centres around the world. Each centre uses different criteria, including different SST thresholds. Therefore, variations between centres on the current ENSO state should be expected, especially when conditions are borderline. The SSTs over the central and eastern Pacific were still warmer than average in February 2019 (Figure 1). These warmer temperatures over the Nino3.4 region (black box) weakened compared to January 2019 and were spatially less extensive. Figure 1: Detrended SST anomalies for February 2019 with respect to 1976-2014 climatology using ERSST v5 data. Warm shades show regions of relative warming, while cool shades show regions of relative cooling. The tropical Pacific Ocean Nino3.4 Region is outlined in black. Looking at the Nino3.4 index over the past year (Figure 2), after the 2017-2018 La Niña, the 1-month Nino3.4 value continued warming until reaching its peak in November 2018 and having crossed the El Niño threshold (0.65°C) for 2 months (October and November 2018). 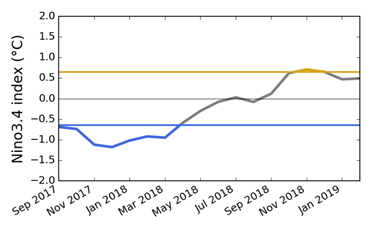 Subsequently the Nino3.4 value started to weaken again in December 2018 and January 2019. For El Niño conditions to be present, 1-month warm SST anomalies (observed or forecast) should persist for at least four months above the threshold, with at least one of the months observed along supporting atmospheric observations. Figure 2: The Nino3.4 index using the 1-month SST anomalies. Warm anomalies (≥ +0.65°C; brown) correspond to El Niño conditions while cold anomalies (≤ -0.65°C; blue) correspond to La Niña conditions; otherwise neutral (> -0.65°C and < +0.65°C; grey). The ENSO forecasts from Copernicus C3S (Figure 3), show a range of forecast of Nino3.4 levels. From May 2019 onwards, models generally show a continued increase in the Nino3.4 values. However, there is still a range of possible outcomes from neutral to strong El Niño. The high degree of uncertainty is consistent with the poor predictability at this time of year for El Niño beyond boreal spring. 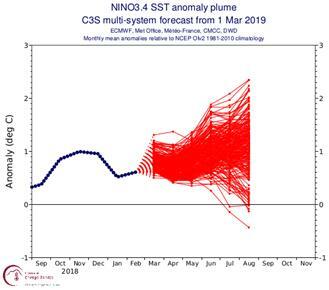 Figure 3: Forecasts of Nino3.4 index’s strength for 2019 from various seasonal prediction models of international climate centres (image credit: Copernicus C3S). To classify a historical El Niño event, the 3-month average Nino3.4 value must be above 0.65 for 5°C or more consecutive months. For La Niña events, the threshold is -0.65°C. Otherwise it is considered neutral. ENSO events with a peak value above 1.5°C are considered to be strong. Otherwise, the events are considered weak to moderate in strength. El Niño/La Niña events are generally only defined after the event. The following figure (Figure 4) shows the development of the Nino3.4 index in 2015-18 in comparison to other El Niño/La Niña events. Figure 4: Three-month Nino3.4 index development and retreat of different El Niño (left)/La Niña (right) events since the 1960s. The most recent El Niño and La Niña events are in red and purple, respectively. 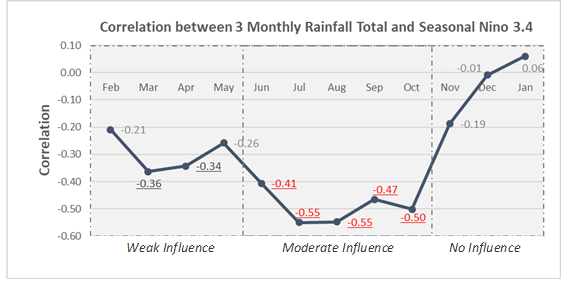 During February to May, there is negative but weak correlation of ENSO on rainfall (statistically significant at 95% level for March and April). Negative correlation means positive Nino3.4 leads to lesser rainfall and vice versa (Figure 5). During the period between June and October, Singapore would normally experience drier and warmer conditions during El Niño events (negative correlations are statistically significant at 99% level). The opposite, i.e. wetter conditions over Singapore, usually occurs during La Niña events. No two El Niño events or two La Niña events are alike in terms of their impacts on Singapore’s rainfall and temperature. Furthermore, the strength of events and the corresponding impact do not always scale. Particularly during this time of year (February to May), there is large variability in the amount of rainfall within each of the three ENSO categories: El Niño, Neutral, and La Niña (Figure 6). Figure 5: Correlation between total seasonal rainfall (averaged over 5 Singapore stations) and seasonal Nino3.4 index from 1961-2017 centred on the month indicated (e.g. for June’s value it corresponds to season May-June-July). The statistically significant correlations at 95% level are underlined, at 99% level in red. Figure 6: (Top-Left) Singapore rainfall anomalies for February to May (as a percentage of departure from long-term rainfall average) arranged in the order from strong La Niña (left) to strong El Niño (right). Brown bars denote El Niño years, blue bars denote La Niña years, and grey bars denote ENSO neutral years. Turkington, T., Timbal, B., & Rahmat, R. (2018). The impact of global warming on sea surface temperature based El Nino Southern Oscillation monitoring indices. International Journal of Climatology, 39(2).